Many people turn to smoothies believing they're a good way to get more nutrients in their diet. But some smoothies you buy can be loaded with sugar. Consumer reports food experts say that to make your smoothie really healthy, you’re better off to make it yourself. “The advantage of smoothies over juice is that they contain the whole fruit, which provides fibre. It’s also easy to add vegetables, protein and even whole grains,” said Amy Keating, Consumer Reports registered dietician. Begin with a protein base, like almond or regular milk and yogurt. Not only is it good to have lots of fruits and veggies in your diet, it’s even better to change them up so you benefit from different nutrients. For example, kale and pineapple: The fruit’s sweetness dominates and the kale is loaded with antioxidants. “I make it a habit to freeze extra veggies from dinner, and any fruit that’s getting too ripe. That way I have ingredients on hand,” Keating explained. To give your smoothies that satisfying thickness, you can use apples, avocado, bananas, yogurt or nut butters. 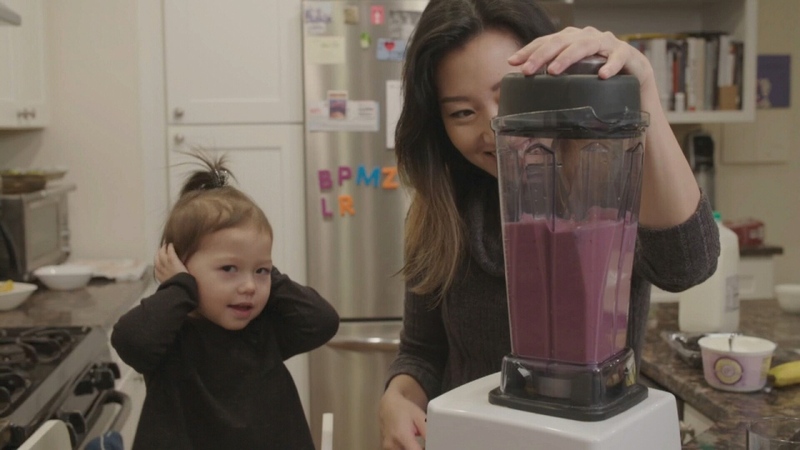 Grace Choi and her daughter Kasper enjoy making smoothies.